Ask Angie et al: tips for packing for and shopping in Japan? Dressing for effect + body type = flattery? My fashion neurosis is now in overdrive. I'm leaving for Japan on Friday and after weeks (yes weeks!) of deliberation, I think I've finally figured out what's coming with me. Usually on a trip like this, I would be very practical and pack what I needed for sightseeing and hiking, and maybe dress it up a bit around the edges. But when I’m heading for world's finest fashion nation (sorry skylurker, even better than France!) I have to bring my A-game. It starts and ends with the shoes. They need to be comfortable. They need to come off easily indoors. They need to be as smart and formal as possible. I’m packing three pairs. 1. 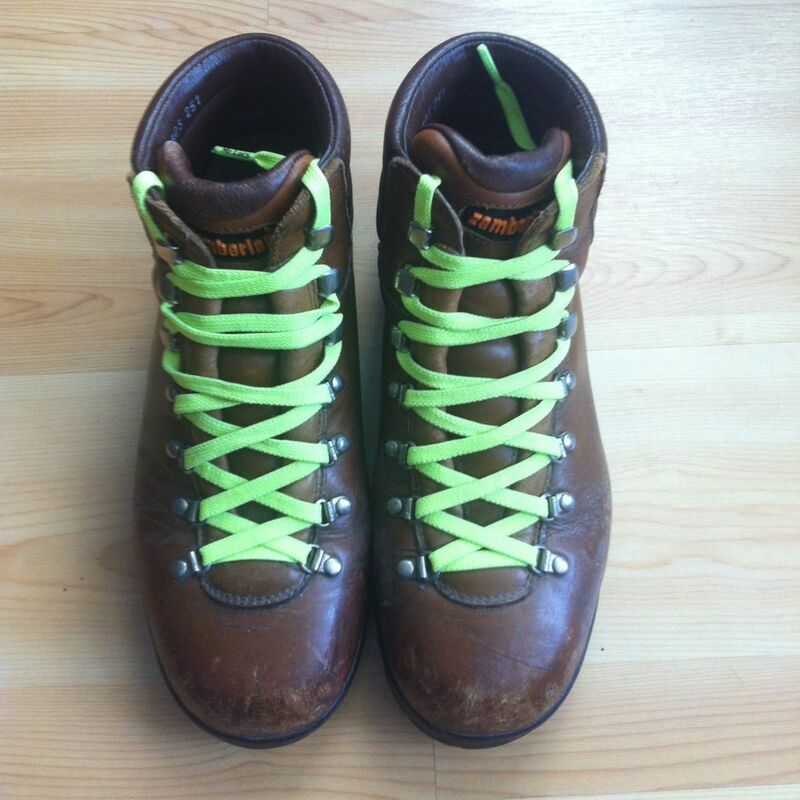 Hiking boots - for outdoors and acting basic. We're planning a few days hiking between city visits, so they need to come with me. The big challenge is always to work gear into my holiday wardrobe and make them worth their weight without sacrificing style. Arcteryx hiking pants - Not bad for gear. Nice material, nice cut. Two button down shirts one Uniqlo +J, one Paul Smith (not pictured.) A good way to smarten up the hiking pants and boots. Mamut Gore-Tex anorak (not pictured) Honestly, I’d rather not take this at all. Velcro! The horror! I can’t be without it on the side of a hill in a rainstorm though, so in it goes. Uniqlo compact down jacket - Their best product ever. Incredibly useful and actually rather cute. Three stripy long sleeved tees. They can make anything look stylish. 2. George Cox creepers - for urban cool. These are a cult item in Japan apparently. They tick all the boxes, being smart, comfortable and easily slipped on and off. Convertible bomber jacket, made by me. A great team player and a good counterpoint to the hiking boots. Leather and wool jumper, made by me. Completes the olive/cognac/citron combo. 3. Trippen Dream booties - for dressing up. I need something dressier than the creepers and these really up the ante. Not so easy to slip on and off, but not so difficult either. Improbably comfortable, these wear like sneakers even with the platform. White shirt dress, made by me after an avant-garde classic by Issey Miyake. Has to come along. Boho-lite with hiking pants and boots, minimal urban cool with all black. White plisse midi skirt, vintage. Another item trending in Tokyo. Chic and ladylike with the Trippens and Breton shirt, downtown cool with creepers and leather jumper and surprisingly workable Harajuku style with the Issey shirt, convertible bomber and hiking boots, if I can work up the nerve. Multicolour short sleeve knit from Cos. Great with the skirt, in case I want to make like a gangsta and flash some ink. Taffeta bomber by Back. Not a duplicate, more of a complement. White needs black and this is dressier than the compact down jacket. Lightweight, packs tiny. I may swap this out for my pagoda shoulder blazer, space permitting. Black silk blouse ByBrown, not pictured. Perfect with black pants in case I need to get really fancy. And that’s it. I think I’ve covered all bases, things mix and match fairly well and it should all fit in a small suitcase, along with underwear, socks, swimwear, one or two tees and a couple of scarves and hats. Weather forecast says highs of around 20C/68F, so I'm thinking I'll be warm enough with layering. If you’ve even read this far, (thank you for your patience with my overthinking!) I’d really value your opinion. This is a pair of shoes and several garments more than I’d normally pack, but I don’t usually go from very casual to very dressy in a single capsule. What do you think? Am I being over-ambitious with the dressy choices? Can you spot any gaps? Should I try to make room for the blazer instead of the second bomber? If you're wondering why I've been relatively active here while I'm supposed to be very busy, it's because I'm all demob happy. As of next Friday, Mr Edge and I are off to Japan for three weeks. It's been ages since we've had a really good, long vacation together and we're both beyond excited! This isn't just a holiday, it's a field trip. I'm a huge fan of Japanese style and I'm a little overwhelmed at the prospect of travelling and shopping in my idea of fashion nirvana, birthplace of the holy trinity of Yamamoto, Kawakubo and Miyake. I'd love to hear from anyone familiar with the region as to what I should be packing, and once there, where I should be going! With regard to dressing, I've already abandoned any and all hope of competing with stylish locals, but I'd like at least to be prepared for every occasion. My travel capsule needs to cover the range of activities from rural hiking to city walking to more formal outings such as dining out and possible theatre visits, with the added complication of transitional weather. So my first question is: should I pack a few dressy options to compliment my basic urban tourist's wardrobe? Will I feel underdressed in polite company in smart-casual garb? Should I make space in the luggage for one or two wildcards or travel as light as possible, leaving room for all-important shopping? Speaking of which, I need some shopping tips! Angie, as an expert shopper the world over and a seasoned traveller in the region, I'd love to know what retail experiences you think should not be missed! Angie’s insightful comment on my post about a coat I made got me thinking. Taking off my aspiring designers hat for a moment and considering my own personal style, my first thought about this was: true enough. For me, style is far more about creating a visual impression than it is about showing off physical attributes to best advantage. Most of the time the idea is to look dramatic, interesting and a little bit different, and to be honest, looking attractive as a woman is not always very high on my list of priorities. On reflection though, I realised that this is not the case at all. Whatever the style, be it bold or understated, nobody wants to get it wrong and I need to know what works and doesn’t work for me as much as the next woman. This brings me to what I discovered a little while ago about Kibbe types. Now, I have a real love-hate relationship with this system. Most of what I've read about it is nonsense, and don’t even get me started on the styling efforts I see around the Internet. But when I first encountered it (via this very forum) a penny dropped for me, I could see exactly where it came from aesthetically and I realised that a lot of what I like to wear is very much in line with that way thinking. Put simply, the raw material of my physical appearance (dramatic/natural) gives me access to bold, rectangular shapes and oversized, unstructured silhouettes. They happen to look good on me, often a lot better than, say, skinny jeans with classic tailoring, or those fit and flare dresses that are very popular right now, which don’t look good on me at all. In that respect, I could speculate that my aesthetic preferences have been shaped by something I like to wear simply because it suits me. So my question is, do we think of these shapes as unflattering because they really are unflattering (i.e. not many people can pull them off) or because they don't define the human (female) body in the same way as, say, a tailored jacket or a form-fitting dress? To what extent are our ideas about flattery shaped by contemporary standards of beauty and conventions around getting dressed? All of this is not to argue with Angie that the coat doesn’t need tweaking (it does) but more to consider what we think of as flattering. Are there things that look great on you that no-one else can wear? Or is there something universally considered flattering that doesn’t suit you at all? Do you ever put an effect you want to create above flattering, or are you always going for JFE? Ladies, what does flattering mean to you? In limbo between designs in draft, works in progress and completed prototypes, I’m taking a breather for a couple of days while I work out what to do next. My therapist encouraged me to take the pressure off this flurry of activity and focus on planning my daily routine. Wise advice. In the meantime, here’s another prototype. The germ of this idea dates back to AM’s awesome saddlebag wrap, which made me want to wear faux fur again. I stalked the fabric back then and finally went back for it at the end of the summer by which time there was almost nothing left on the roll. I bought what I could comfortably afford and took it home. My original sewing plan for the winter was for two garments: a fur vest I could layer over jackets and a plain black coat in something else. Then at some point I realised that the blouse that became a bomber jacket could also be a reversible coat which would convert into a wrap, filling both of these criteria and then some. You get the idea. Mixing up the fur on one side with a piece of alpaca (miraculously found on Amsterdam’s Monday fabric market) and a black nylon shell on the other gives a garment with many applications. I like the glam meets boho meets urban vibe of the thing and it seems to go with almost everything. It’s comfortable over a tee in milder weather and I expect to wear it later in the season over a leather jacket. The waterproof fabric means I can flip it and wear it in the rain without drenching the pelt. Here’s the thing though. It’s a design with potential and I want to make more like it. But unlike the bomber jacket there’s a problem with the economics - materials alone are expensive and fur is challenging to sew. This leaves me wondering how I can make this coat happen. As ever, your thoughts and comments are most gratefully received. In computer development, one of the golden rules of prototyping is that you should plan to throw one away, because you will anyway. Well. I hate wasted effort, let alone wasted fabric, so I've modified my planning. The ones I should otherwise throw away will get the ultimate sanity check. This means that all mistakes in the production process have to be put right and the end result needs to be wearable. The downside of this is that everything goes together in a way that supports design decisions rather than easy construction, so sewing these up can sometimes feel like a monumental effort. 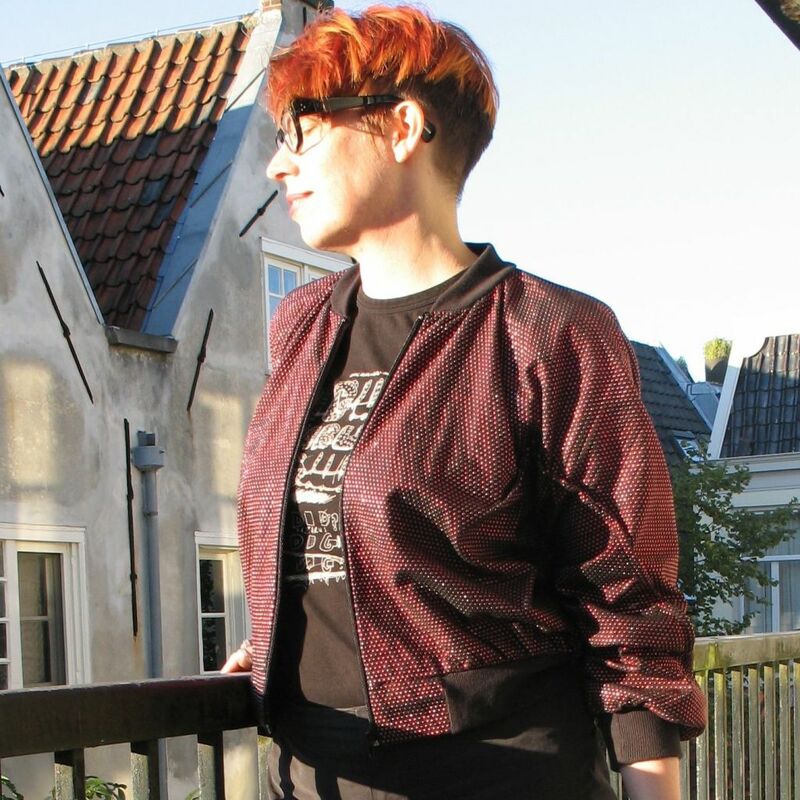 The first item is a bomber jacket based on the one piece blouse I showed a few weeks ago. When I posted that one I didn’t show off its coolest feature: you can turn it upside down and wear it as a shrug. I worked the concept through on this garment, adding a vent in the back that converts into a draped collar. In principle it’s also reversible which means four looks for the price of one. The downside it that now I don’t know where to put the label. I’ve used a piece of vintage fabric, cotton broadcloth with metallic studs. It was gifted to me quite some years ago by a friend who bet me at the time that I couldn’t get a bomber jacket out of two square meters. It’s taken me a while to figure it out but I reckon I won the wager. I managed to get a few shots in the evening sun to show off the sparkle, but if I make more of these they’ll probably be in sober tweed or glamorous silk and not trashy sequins. The second is a draped tunic with bandage sleeves that close with thumb loops. This is not particularly short on material but I can claim close to zero waste. It’s good fun to wear and people seem to like it but it’s not terribly practical and I’m still looking the perfect fabric for it. It also needs bra loops because even with a pin it’s hard to wear without flashing a bit of strap. For the picture I was inspired by all the talk about brooches last week to pin it up with a bizarre object my sister gave me. I have no idea who made this or what they were thinking of, but I find it strangely appealing. Nevertheless, British comedy fans will know exactly what I’m talking about when I say it reminds me of that episode in the second series of Blackadder where Percy uses alchemy to create something green and goes on to make jewellery that looks like snot. Both outfits feature the pants that were the starting point for my minimal waste pattern cutting project. 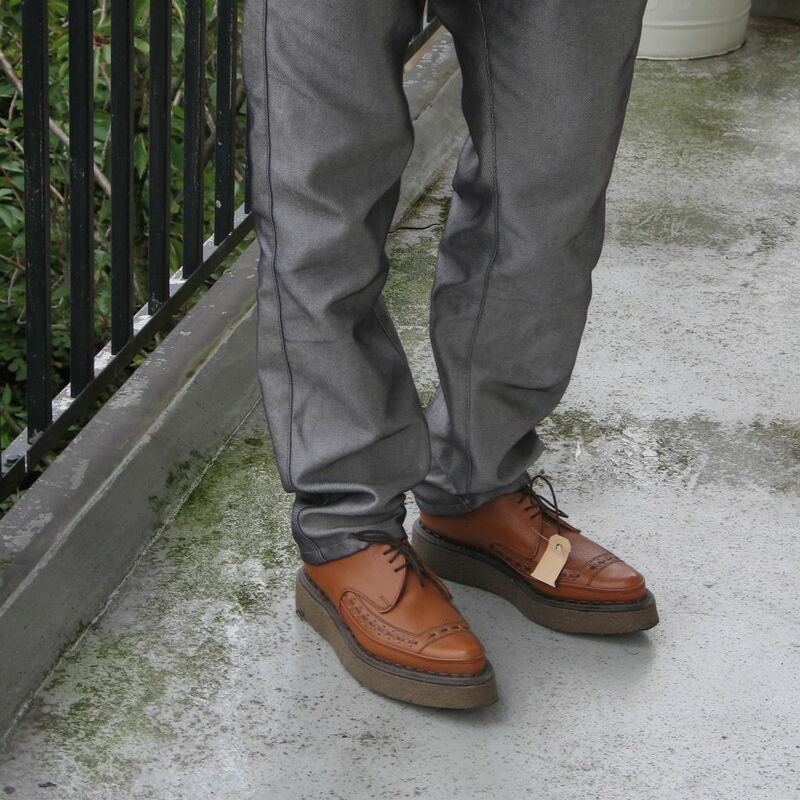 I wanted to create a pair of trousers out of a meter of fabric that didn't look like pyjamas. After some trial and error and a lot of draping I dropped the crotch, moved the inseam to the front and curved the hem, which gives shape in the leg and volume in the seat. Not everyone’s cup of tea but I’ve found them very wearable and they’ve been in heavy rotation throughout the summer. Styled with my Trippen platforms, because I read somewhere that statement boots with cropped pants were A Thing this year. So please tell me, what do you think? Does a convertible jacket appeal to you? Would you wear a bandage sleeve? Do these pants look cool or sloppy? Your critical comments and feedback on each of these garments is very much appreciated.